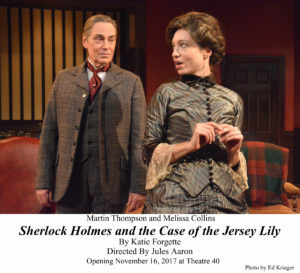 Playwright Katie Forgette had a clever idea for a stage mystery: have fiction’s greatest detective get involved in a case with real life characters in 1894 London. Novelist Nicholas Meyer had done it successfully in 1974 in The Seven-Per-Cent Solution in which Sherlock Holmes was cured of his cocaine addiction by Sigmund Freud. The novel was turned into an unsuccessful film in 1976 and is best known today as the origin of the Stephen Sondheim song “I Never Do Anything Twice”. Forgette’s work may also have worked better as a novel; as a play it is a bit cumbersome and unexciting on stage. No matter how hard director Jules Aaron and his competent cast try, they just can’t infuse enough menace and thrills into Sherlock Holmes and the Case of the Jersey Lily at Theatre 40. 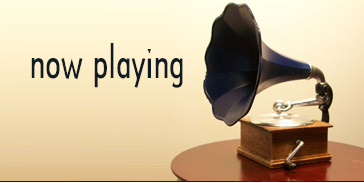 Although the play, including intermission, comes in at two hours, it seems much longer. 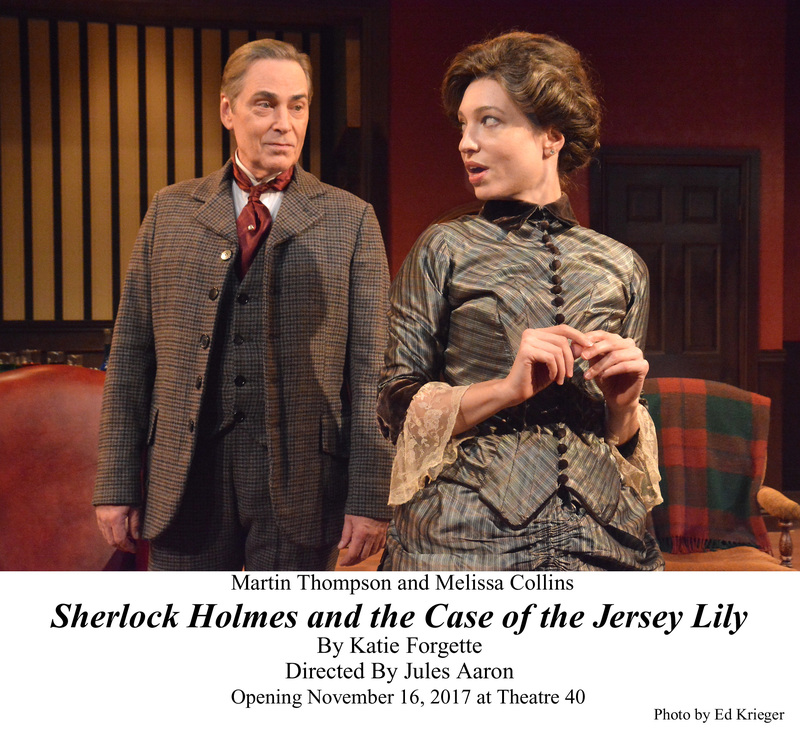 Sherlock Holmes (Martin Thompson) and his faithful assistant and biographer Dr. John Watson (John Wallace Combs) are having tea when a mysterious woman arrives and ask for Holmes’s help with a problem. He soon unmasks her as a fraud as well as the famous actress Mrs. Lillie Langtry (Melissa Collins). Her friend, playwright Oscar Wilde (Scott Facher), recommended Holmes to her but she needed to test him and his loyalty. She is being blackmailed for intimate letters she had exchanged with the married Prince of Wales, heir to Queen Victoria’s throne. 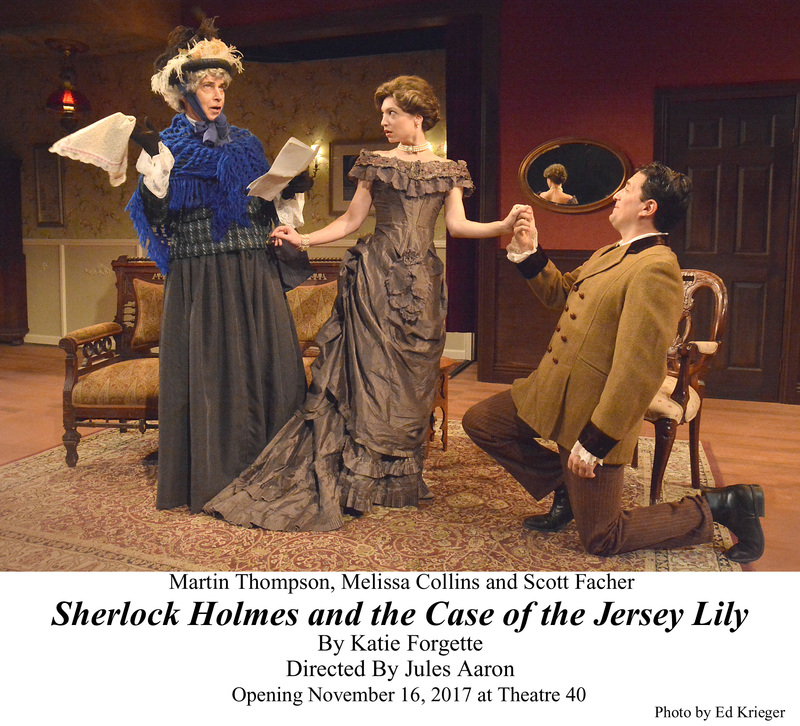 Holmes agrees to take her case and, in disguise, he is soon doing a scene from Wilde’s The Importance of Being Earnest with Wilde and Langtry while awaiting the arrival of her blackmailer. There are attempts to inject some action and peril, along with thrills and chills, into the mix but they mostly fall flat in the intimate confines of the Rueben Cordova Theatre. The villains of the piece—McGlynn, a carnival knife thrower and wannabe actress, and her thick-headed nephew Smythe (Shawn Savage) add more comedy than danger to their roles. 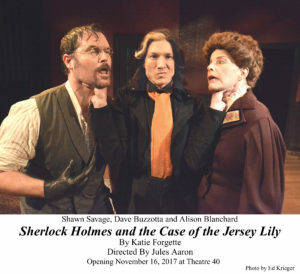 Even the infamous criminal mastermind behind the plot, Professor Moriarty (Dave Buzzotta), comes off more as a petulant child than a dangerous psychopath. Thompson lacks the charm and the haughtiness of Holmes. The best moments are provided by Wilde’s one-liners which come from his real life, not the playwright. The production’s best asset is Jeff G. Rack’s inventive set design that transforms into various locales. Theatre 40, 241 S. Moreno Dr. in Beverly Hills. Ends Dec.17 www.theatre40.org.